Yay! Finally finished re-knitting this a couple days ago. This was my second go at it, as I realized after the first attempt that I picked stupid colors for my home, so I tried dyeing the whole thing, which made it unravel from the center, so I had to frog the whole damn thing and start over. It’s about 2×3 & I’m really happy with the cushiness of it–would be very nice for a bedside rug. The whole thing was made from rag shirts left behind when we moved in. I’ve already started a big bag of old T-shirts in the laundry room for a huge one I plan to knit in 4 long strips. As soon as the sack is full, I’ll buy some dye from Dharma, dye them & get started. Being a good stashalonger, I finally went into my WIP bin and started to frog or finish everything. First, I ripped out this and this, as I’ve lost interest in both. And this, because, who cares, it’s just a heel, and what was I thinking, putting a bootie cuff on gray worsted wool socks? I think the yarn will make nice socks, though. Maybe I’ll try that Hello Yarn worsted sock pattern I’ve been eyeballing. Sock Wars was very effective in making socks less intimidating. You don’t have to be mad or comfortable with 0s to knit dandy socks, hurrah! I also made this hat for Ron, a 2-ply yarn I spun at Yarn School from some gray Rambouillet I processed myself, carded with some commercial dyed corriedale. The yarn came out very manly, I think. The light in the picture is dreadful–that’s a sunset coming in. And while lovely in person, it makes getting a normal picture absolutely impossible. 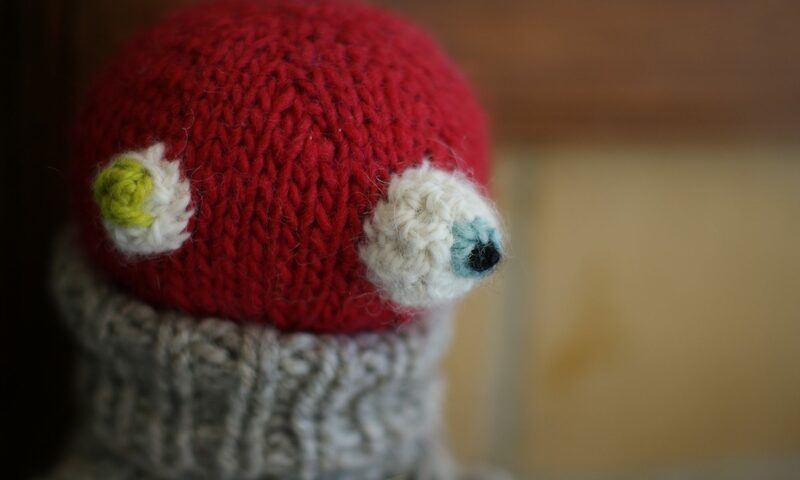 The yarn was very soft and bouncy and stretchy, but there was only just enough for the hat and some tiny little nubs of football helmet earflaps, which just cover his earlobes. Maybe I’ll write up the pattern. It took like five seconds to knit. I think it was just 40 st to start! Oh, and I’m not a Yeti, nor am I wearing a fun fur blouse; it’s a bunny suit, minus the hood. I took the picture on Halloween right before we set up. It’s another handspun hat, made of one of my first 2-plys: what awful stuff! But great for a winter hat, actually, since it’s so freaking dense. I should probably block it, as it’s particularly unkempt. I haven’t decided whether this is for me or someone else. This also took like a minute to knit, as the yarn was even huger. I think I cast on 36 st to start! Gee whiz! I probably should write them both up. It’s good to have some no-brainer used for nutty thick beginners’ handspun. I’m doing pretty darn well on my stashalong. I’m going to cull a bunch more yarn for the stash swap at The Studio’s Fall Fiber Fest this Sunday, and maybe spin some, too! My problem is that I always bring home a ton of yarn too. And since I really want to give free community knitting classes this winter, it’s very, very hard to resist. I guess all that stuff doesn’t really count as my stash. And I could put some kind of caveat on it, like, if I don’t start the class by the end of 2008, it all goes to charity. Speaking of charity, right now I’m working on my Red Scarf Campaign scarf. I’m using Valley Yarns Berkshire and the Rib of Doom from Sock Wars. Which also has a less colorful name I can’t remember. It makes a nice cushy, cozy unisex scarf. I think I’m going to go snuggle into bed and watch some Battlestar Galactica and see how much farther I can get on the scarf. And maybe get a little action on the side. I’ve been eyeing my crappy first spinnings and thinking they would knit into great cat toys. :) I’d barely have to use any stuffing! That hat looks so fetching with your Brooksie bob. Love the rug. I’m making a rug with the awful yarns I’ve made since Yarn School, and some I carded up from scraps off the floor there. It’s going to be reeeeally colorful, but it’s for my room, so I’ll love it in private. I want to come back. When’s the next class? You watch BSG AND you are a badass knitter? I think i love you. :) I just finished my own interpretation of the various devil hats out there. I AM BURSTING WITH PRIDE! My first finished project! YIppee! And I cannot wait for you book!